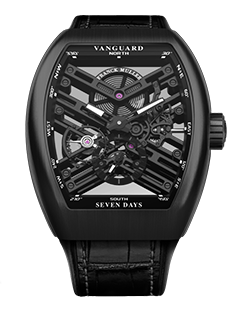 The famous Vanguard collection has enriched itself with a new reference: the Vanguard Skeleton “V45 S6 SQT NR BR”. 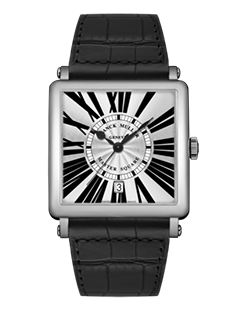 Thanks to a V form case with open upside and backside, we can admire the complex functioning of a movement that offers 7-day power reserve to the watch. 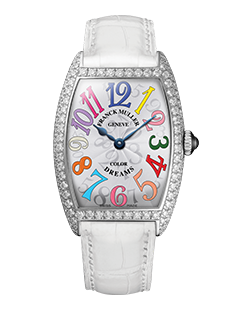 All the steps during the confection of the watches, such as assembling and polishing, are made in the Franck Muller manufacture with the greatest scrunity, which unveils a stunning rendering. 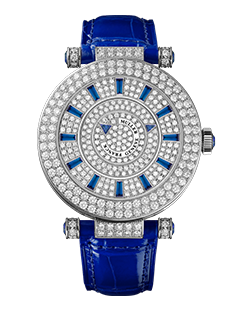 Presented in 2014, the Vanguard collection is distinguished by a unique and sportive design that enjoys an increasing popularity and that has succeeded in finding a place between other Franck Müller famous collections like the Cintrée Curvex and the Long Island.